Amatrol’s Instrumented DC-Electric Torque Wrench Learning System (95-PAS5) adds to the Production Assembly training system (950-PAS1) to teach use of an instrumented impulse torque wrench in fastener assembly. This production assembly training system includes a right-angle nutrunner, control box and cable, 3/8-in. drive 19mm socket, and a 90-degree flange. 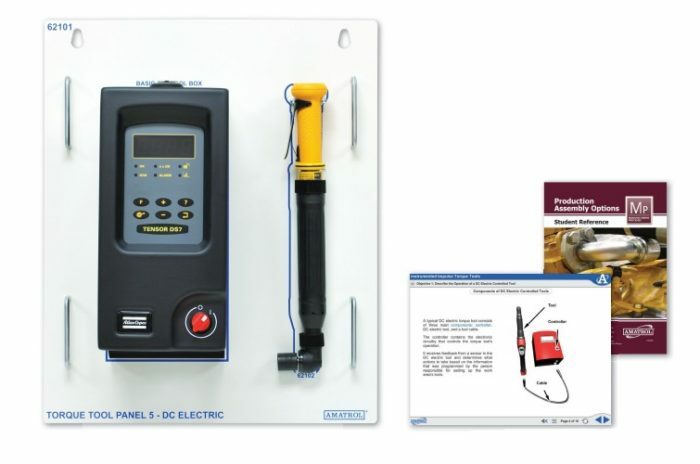 This system covers instrumented impulse torque wrenches through skills like DC electric controlled tool operation and inspection and how to assemble a threaded fastener using a DC electric controlled tool. The model 95-PAS5 includes multimedia-based student learning materials for both theory and lab, and teacher’s assessment guide. The interactive curriculum includes virtual simulation of key skills, allowing learners to practice skills in advance of actually working on the equipment. This system uses industrial quality components to help assure that students are better prepared for what they will encounter on the job and to withstand frequent student use. The multimedia-based curriculum can be accessed anywhere, allowing businesses to increase delivery of high-quality assembly practices in far flung organizations.